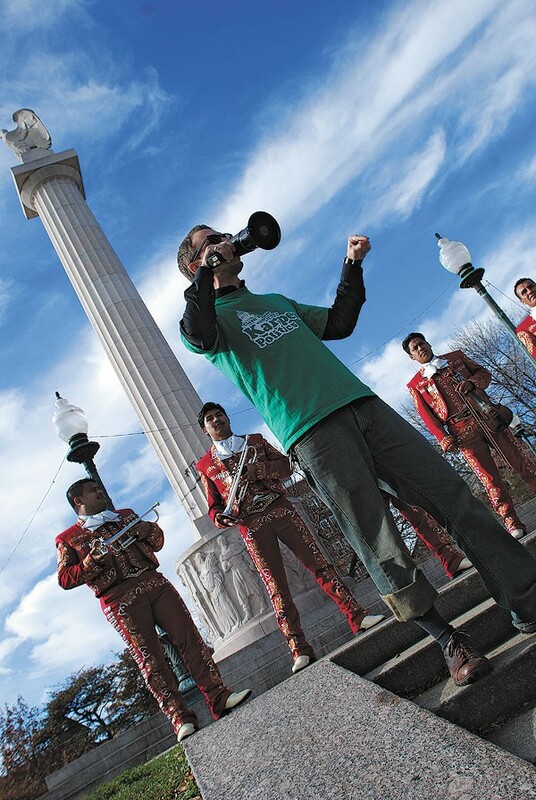 Green Party candidate Jeremy Karpen says that as he was greeting voters outside his Logan Square polling place on Election Day, he watched the same scenario time and again. A campaign worker for 39th District state rep Toni Berrios, whom Karpen was trying to unseat, would pull a voter aside, greet him familiarly in Spanish, hand him a palm card . . . and then tell him that Karpen was with the Tea Party. When the polls closed, Karpen and other Greens went to Cole's, a bar on Milwaukee Avenue not far from the Greens' campaign headquarters on Fullerton, to await the returns. The mood was buoyant—until the results started coming in. Berrios trounced Karpen, 65 percent to 35 percent. And yet for Illinois Greens, Karpen's results were the good news. At the head of the ticket, in the race for governor, Carbondale lawyer Rich Whitney got 3 percent statewide. The Greens needed him to get 5 percent to virtually assure them ballot spots in all statewide partisan elections for the next four years, a luxury they've enjoyed as an "established political party" since 2006, when Whitney got 10 percent in the governor's race. In Chicago Whitney got just 2.6 percent of the vote, down from 7.3 percent in 2006. In the race for Cook County Board president, Green candidate Tom Tresser took 4 percent despite a relatively high profile from his leadership of the opposition to the city's Olympic bid. The Greens didn't run any African-Americans for office in 2006 and drew little support from black voters. Partly to broaden their appeal, they ran seven African-American candidates this time, the most notable being LeAlan Jones, the 31-year-old south-sider who sought Barack Obama's former U.S. Senate seat. Jones had never run for office but wasn't a complete unknown going into the race; he'd gained fame as a teen journalist describing life in the Ida B. Wells housing projects in two acclaimed National Public Radio documentaries. He got just 2.6 percent of the vote in Chicago and 3 percent statewide. The Greens, drastically underfunded and as a result excluded from most mainstream media coverage, are still struggling to get their message out. And that message can vary: the Green candidates in this election weren't always on the same page. The party's leaders say that's just grassroots democracy in action. But the fundamental problem remains: the reluctance of liberal voters to vote Green when it could cost a Democrat an election. The recent results across the board were "a pretty bitter pill," Whitney says. "It was certainly disappointing, but in the Green Party we tend not to get too discouraged for too long." It's a healthy attitude, maybe even necessary, given the challenges the Greens faced this time, and will likely face in the foreseeable future. Greens are best known for their stance on environmental issues. 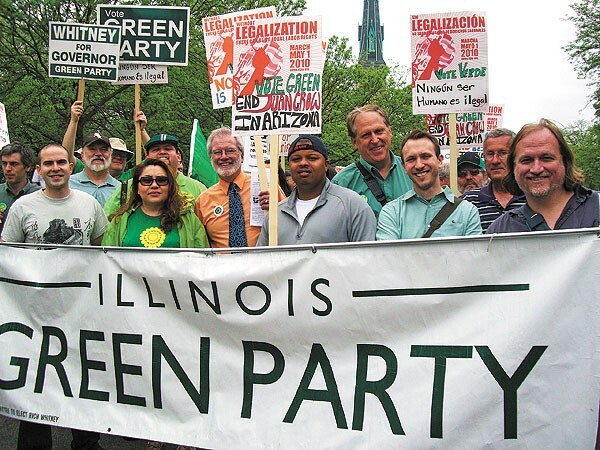 The Illinois Green Party calls for government subsidies for solar and wind energy and for capping carbon dioxide emissions by strictly regulating greenhouse gas emitters and gradually hiking fees on them. The party favors heavily taxing polluters and increasing fuel efficiency standards for cars, and supports high-speed rail and bike-friendly urban planning. But the Greens also support universal single-payer health care, raising the minimum wage, repealing free trade agreements, and granting legal status to undocumented immigrants currently living in the U.S. They want to eliminate government subsidies and tax breaks for major corporations, and they're for tax breaks and incentives for small businesses that would make it easier for people to produce, buy, and sell goods locally. Corporations conflict with "the ideals of representative democracy, and social and environmental responsibility and accountability," the Greens' platform says. It calls for a shareholder bill of rights to let people demand changes of corporations. Greens don't take corporate donations—and given their views, it seems unlikely they've had to turn down many. The lack of corporate funding, they say, frees them from the influence corporations exert over most candidates. But it also means Greens are vastly outspent by their mainstream opponents. Democrat Pat Quinn spent more than $13 million on his successful effort to remain governor, Republican Bill Brady more than $15 million on his near-miss. Both candidates flooded TV and radio with commercials. Whitney spent $100,000 on his campaign, which went mainly for a campaign manager and travel, office, and printing expenses. He ran ads on Google and Facebook, but his TV and radio exposure consisted of two cable ads and a promo on a Spanish-language radio station. While Democrats and Republicans can afford to pay Election Day workers, the Greens rely almost solely on volunteers. Illinois Green Party chair Phil Huckelberry says Democratic Party workers in Logan Square were "baffled that someone would be at a polling place for free. It was a strange and foreign concept to people who were being paid to be there and didn't care who the candidate was." Unable to buy visibility, Greens depend on free media exposure to augment their grassroots campaign efforts, but they get little of it. Notwithstanding their place on the ballot, Whitney and Jones were snubbed by key debates, notably one hosted by the League of Women Voters on ABC7 and one on WTTW's Chicago Tonight. Greens protested outside WTTW's studios on October 28, as that debate went on, and Whitney, Jones, and the party have sued WTTW in federal court, saying the publicly funded station violated its tax-exempt status by engaging in political activity—namely promoting the candidates of two established parties over a third. In their complaint the Greens argue that the "rapidly escalating corporate financing of elections" makes it "more important than ever before that publicly funded broadcasters . . . strictly adhere to their mission of serving the public, and avoid all partisan political activity." A statement from WTTW spokesperson Julia Maish said the station decides who to include in its candidate forums based on non-partisan polling, a candidate's fund-raising, "evidence of a vigorous campaign," and other factors. She declined further comment. The Illinois Greens think minority and low-income urban residents in particular should find their party's platform appealing. They propose government incentives to help workers take over failing factories and call for reforming public aid so it offers more job training and education. They favor expanding services for those in financial distress and creating "green jobs" in energy and transportation. But they haven't won over those residents yet. In 2006, Whitney got 14 percent or more in seven Chicago wards—all on the predominantly white north side. The wards included Logan Square, Edgewater, Rogers Park, Lakeview, Ravenswood, West Town, Wicker Park, Humboldt Park, and Bucktown. In most of the predominantly black wards on the south and west sides, Whitney got less than two percent in that 2006 race. It wasn't only most Green voters who were white that year, but all of the Green candidates. This year Whitney put his Chicago campaign office in Bronzeville, at 516 E. 47th, sharing it with fellow Green candidates. But he did about as poorly in the black wards this time as four years ago, and the seven African-American candidates didn't do well in the black wards either. The results for Senate candidate LeAlan Jones mirrored Whitney's: he got about 2 percent in black wards on the south and west sides and about 4 percent on the north side. Jones says African-American voters are largely unaware of the Green Party and what it stands for, and that their loyalty to the Democrats is hard to pierce. He calls them "Manchurian voters" who back the Democrat no questions asked. "They don't know how to support non-machine candidates," he says. "You can put anyone before them and very little diligence goes into examining the candidates." Jones wishes the Greens had spent more on his race. Huckelberry, the party's chair, says the party's minority candidates generally hoped for more support—including money—from the party than the party could give. "They wanted something more top-down instead of bottom-up," Huckelberry says. "The assumptions about the party's resources were much greater than what existed." Jones says he plans to run for office again and would consider running as a Green, but would likely do so only if the party makes his campaign its main focus. "The party has great ambition, but we're spread too thin," he says. "If the party wants to get something done on a major scale it will have to concentrate its efforts." Kenny Williams of South Holland, an African-American Green candidate for state representative, fared better than most Greens. A 47-year-old barber, school board member, and youth football coach, Williams got 17 percent of the vote in the 29th District, which is mostly in the south suburbs but extends into Chicago's Roseland neighborhood. Williams attributes his success to his connections in the community. "I know lots of people from cutting their hair, from cutting their children's hair," he says. Like Jones, he found his party affiliation bewildering to many voters. "The Green Party is just foreign to African-Americans—and Caucasians—out here in the south suburbs. It's like the Tea Party almost—that's how people look at it. Anything that isn't Democratic they shy away from." But even Williams's decent showing doesn't necessarily bode well for Greens. He ran as a Green not because of his deep commitment to Green issues but because of the ballot access it gave him. He'd planned to run as a Democrat, but withdrew before the primary when his petition signatures were challenged. He says the Republican Party has approached him about running for state rep again in two years. "I like Republicans," he says. "I'm a businessman, I understand why we don't want to increase the minimum wage right now." In Jesse Jackson Jr.'s Second District, also extending from the south suburbs into the south side, Anthony Williams, an African-American pastor with distinctly un-Green views, got 6 percent. Williams is anti-gay marriage, anti-choice, and anti-immigration—but he'd beaten the endorsed Green candidate in the primary. Even the Cook County Green Party chair, Alberto Bocanegra, doesn't seem particularly wedded to his party's stance on key issues. He's running against incumbent George Cardenas for alderman of the predominantly Latino 12th Ward, which includes parts of McKinley Park, Brighton Park, Little Village, and Back of the Yards. Bocanegra sees himself more as an independent than a Green. Instead of talking about environmental or economic justice, he's mainly been calling for more cops on the street and better relations between police and residents. But Bocanegra says that's in line with the Greens' views: "Fighting crime is what social justice means in the 12th Ward. It's about protecting regular people's rights." "It's inevitable that we're going to attract people who have different ideas of how to attack the problems," says Huckelberry, "but who all agree that the Democrats and Republicans are failing us. The Green Party takes the concept of grassroots democracy very seriously. When we say, 'Think globally, act locally,' we mean it. The reality is that acting locally in Englewood often means something different than acting locally in Lincoln Park. There's definitely been a tension as we field candidates of color in trying to make these competing interests synthesize, but this should be seen as a creative tension that helps all of us build better politics and better solutions." In the governor's race, Greens faced a tougher challenge this year than four years ago. The race was tighter than in 2006, when Rod Blagojevich beat Republican Judy Baar Topinka 50 percent to 40 percent and the other 10 percent fell to Whitney. The closer election this year—Quinn edged out Brady by less than 1 percent—made voters less inclined to choose a third-party candidate, Green Party leaders say. They also think liberal Democrats feared Brady more than they'd feared the comparatively moderate Topinka. Indeed, third-party votes declined, from Whitney's 10 percent in 2006 to 7.5 percent total this year. Whitney, the only third-party candidate on the ballot in 2006, had competition this time from independent Scott Lee Cohen and Libertarian Lex Green. Cohen, the pawnbroker who won the Democratic nomination for lieutenant governor, stepped aside from that race after dirt from his divorce file came up for discussion. Then he announced an independent run for governor, spent more than $3 million of his own money on advertising, and won 3.6 percent—more than Whitney. Whitney says Lex Green's name may have also been a minor problem for him, confusing some voters who intended to vote Green Party. Green got .9 percent. The U.S. Senate race was close as well, and Green leaders say that may have similarly discouraged potential voters for LeAlan Jones. "While we may have lost the protest votes, we'd like to think most of our votes are hard-core Green votes," Whitney says. "That's the silver lining here—there's somewhere in the neighborhood of 100,000 [Illinois voters] who were not protest voters, who we would think were consciously voting Green." But that 100,000, hard-core or not, pales next to the more than 1.7 million Quinn got for governor. The Greens clearly have failed to convince many liberals to leave the Democrats for their ranks. Thom Clark, president of Community Media Workshop, which helps Chicago nonprofits connect with media, is a long-time student of local left-wing politics. He considers the Green Party "more symbolic than substantial." As such, he says, it can raise issues not raised by mainstream candidates. But he also worries about Green candidates diverting attention, volunteers, and votes from progressive Democrats who are much more likely to actually get elected and effect change. He wishes the U.S. had "more of a parliamentary system" with "parties that truly represent workers, teachers, and the like, but we don't have that here. It is a representative republic, skewed by money and ten-year redistricting. I don't like it, but it is what it is, and once the cards are dealt, it's getting good people in the [Democratic] party that's important." Huckelberry says Greens need to focus on "dinky little races" in smaller cities and towns where they can actually win and show in practice why Greens are worth electing. "We have to run for governor to be taken seriously by the electorate, so we'll keep doing it. But we need to get more people on school boards, village boards, library boards, park boards, and build the idea of what it means to have Green elected officials." In Chicago and Cook County, though, most such positions are appointed rather than elected. Greens here plan to urge mayoral candidates to propose elected boards for the Chicago Public Schools and the city colleges. (No Greens are running for mayor.) The Metropolitan Water Reclamation District, which oversees the wastewater treatment system, is an elected body. Three spots were open this election, and a Green candidate ran for each, but the most successful of the three got only 4 percent. The statewide "established political party" designation the Green Party won in 2006 meant that Greens, like Democrats and Republicans, needed only 5,000 signatures to get on the primary ballot for statewide office in any partisan race for the next four years. The winner of the primary was then on the ballot in the general election. Now Green candidates won't have primaries, and will need 25,000 signatures to get on the ballot for statewide office in general elections. Green candidates who got at least 5 percent—ten of them, four in Congressional districts and six in state representative districts—this time won ballot access for Greens in that race for 2012. But next year Illinois and other states will remap their electoral districts, as they do after every census—and Greens could be remapped out of some of the few districts where they gained a foothold for 2012. Huckelberry says the party expects to defend its ballot access in court after redistricting. Whitney, who ran twice for state rep as a Green before running for governor in 2006, says he won't run for governor a third time. He doesn't want to be seen as "one of those perennial candidates." Amid the gloomy news, Green Party leaders take heart in some of the young volunteers they attracted this election—such as Lucky Mosqueda, a 22-year-old Latino from Albany Park who volunteered for Whitney. Mosqueda says most Latinos in his neighborhood have no idea who the Greens are. Nor did he four years ago, when he turned 18 and voted for Blagojevich. He soon became disillusioned with the Democratic Party because of the wars in Iraq and Afghanistan and the failure of Democrats to push harder for gay rights. Through connections with Gender JUST, an organization for LGBTQ youth, he learned about the Green Party's gay rights and anti-war stances, as well as its support for universal health care. He thinks more young Latinos would embrace the Green Party if they knew what it stood for, and he's optimistic about the Greens' future. "I'm a metal head, so my message to the Green Party is, just keep on rockin'," he says. "Reach out to more people. Have round table discussions with pizza, tea, vegan food, whatever will bring people together. We're minorities in every way, the Democratic Party isn't representing us, so the Green Party should make more of an effort to let people know they are out there." Karpen, the Logan Square Green who got 35 percent for state rep, says he fared better on the east side of the district, where more white residents live, than on the Latino west side. He says workers for his opponent wrote him off to Latino voters as "a yuppie or a hipster," though he grew up working-class and now is a counselor and supervisor at Mercy Home for Boys and Girls, working with kids from Chicago's poorest neighborhoods. After the election Karpen and other Logan Square Greens began talking about how to keep open their storefront campaign office, a bright space emblazoned with an all-green bucolic mural of solar panels, wind turbines, and people enjoying the outdoors. Karpen envisions it as "a regular fixture of the Illinois Green Party in our community and a hub for supporting local activist movements." He's considering launching a non-profit organization "aimed at increasing civic understanding and access to our political system among high school students." Karpen says that when he returned to his job at Mercy Home after the election, the boys he works with were "extremely curious about the experience of running for office and wanted to understand more about the connections between the issues they face every day and the government. "I want to help them see government as an extension of our communities rather than a separate entity," he says. "I told them, and I firmly believe, that you haven't truly experienced democracy until you have lost an election." "Forty thousand dollars a year for an entry-level journalism job?"